For the past few years, Viewsonic's projector division has been making affordable, high-performance projectors for business and home entertainment. So it came as something of a surprise when they announced the Viewsonic Pro9000, a 1080p projector for home theater with an LED/laser engine. Home theater enthusiasts have been demanding long-life light sources for years, and Viewsonic the first company to introduce a home theater projector with a 20,000 hour light engine that is priced for the wider consumer market. While the idea of a LED/laser home theater projector is sure to excite the imagination of many readers, the reality is somewhat less compelling. 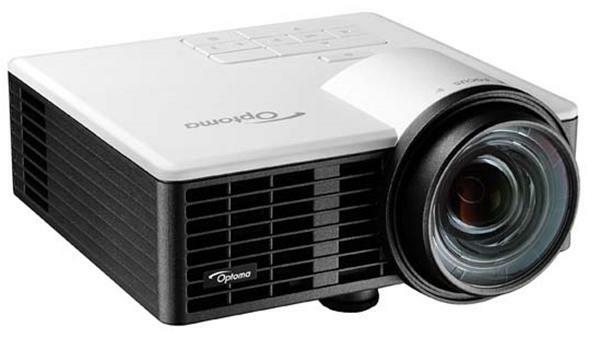 The Pro9000 is capable of projecting 1080p film and video, but it lacks many of the refinements that users have come to expect from home theater projectors in the last few years. Furthermore, at $2999 it lands in the same price range as several more fully-featured 1080p projectors, giving it some stiff competition. The good news is that it is uniquely appropriate for video game use, where its low heat emission and very quick 1-frame input lag make it a better choice than some of its competition. But while the Pro9000 is indisputable proof that lampless home theater projectors can be built, it is not a particularly ideal solution as a home theater projector. It's been a while since we've seen a home theater projector without 3D capability, but here we are. We fired up the Pro9000 in its default Theater mode. Startup time is very fast, and the projector is warmed up and ready to go in under ten seconds. Unlike traditional arc lamps, the hybrid LED/laser system in the Pro9000 reaches maximum brightness seconds after startup, then loses a small amount of brightness over the next few minutes. Our test unit exhibited a 5% decrease in light output from initial startup over the first few minutes of operation before output became stable. Watching a 2D Blu-ray movie, we noticed that the Pro9000 was applying overscan by default on the order of about 3%. One of the benefits to watching a 1080p movie on a 1080p projector is that there is no scaling of the image, so overscan is something you will almost always want to turn off. The exception is if you find artifacts around the edge of the image, which can sometimes be present on live broadcast material or poorly-mastered DVDs. We initially began our review of the Pro9000 with a pre-production sample. That unit had non-defeatable overscan; that is, even with overscan set to 0% the projector was still cutting off a portion of the image. So we tabled the review and requested a production unit. We are happy to report that the overscan issue has been resolved in the main production run. While the projector still defaults to 3% overscan, it can be completely disabled via the menu system. Overall, the picture from the Pro9000 is solid. Theater mode measured 478 lumens on startup and 454 lumens after the warm-up period, which isn't as bright as most home theater projectors these days. It is still plenty of light for a 120" diagonal screen, especially since 3D brightness is not a concern. White balance by default is slanted heavily towards magenta, so we spent some time tweaking the projector and ended up with a better balance of color in the mid-range of the grayscale. Shadows and highlights retained a color cast due to the projector's adjustment limitations. There was some slight crushing of detail in the deepest shadows, but raising brightness very quickly washes out black levels so we decided to live with it. Better still is Standard mode, which after some tweaking (a reduction of blue and an increase to green) actually had similar white balance to Theater mode plus a cleaner 100% white. Standard mode's 943 lumens might be too bright for some smaller screens, so plan accordingly. While the Pro9000 has plenty of competition in the home theater space, one application in which it excels is video games. Video games are typically played at a multiple hour stretch, so the Pro9000's low heat emission will keep the room from getting uncomfortably warm. The projector has very little input lag at 17ms. And, since there's no lamp to change, you won't feel bad about running the projector for hours and hours on end. Please could you say if there was any rainbow effect, thanks. Interesting, but this still doesn't explain what a "hybrid LED/laser" engine is. Lasers and LEDs are both light sources. How are they used together in one of these? Saied - No, we did not see rainbows. Palmer - The projector uses a combination of light emitting diodes and lasers to create red, green, and blue light, which are used to create the image. While this does not require a color wheel, it is still a sequential-color, single DLP chip technology. The high speed of 17ms of the 9000 would seem to remove the necessity of frame interpolation. Is this true or are we mixing two separate functions? Jack -- they are two different things. Input lag measures the time between when a signal is sent to the projector and when that signal is actually displayed, compared to an external reference monitor. The signal that makes it to the projector is still in its native frame rate and can still have all kinds of problems with judder and motion. Frame interpolation smooths out motion in film and video by analyzing the frames of the signal and creating new interstitial frames between them. This makes video appear smoother and drastically reduces judder, but it also increases processing time and thereby also makes input lag worse. Here's an analogy: if you order a pizza from a national chain, they will have it to your door very quickly, but it probably won't be a very good pizza. On the other hand, you can get a really delicious pizza from an actual pizza parlor, but you won't have it in 30 minutes. Increasing quality (by creating interstitial frames) increases delivery time (input lag). The analogy has its limits, one of which is that I'm now hungry for pizza, but I hope that helps. How far away are we from having Epson and Panny use the new LED technology in their annual feature home projectors? Later this year? Or 2014? Or never ??? I'm moving into an off grid house and looking to replace my old Optoma hd70 with something 1080p and more energy efficient due to wanting to keep the power consumption as low as possible (because I'll be living off batteries). Are there any other LED projectors available or should I wait a few months and see what comes out? I am sorry, but this particular review is way too long an tedious, about 80 percent longer than hat it should/could be. Most of us hava no time reading a review of this length on each and every projector out there that we may be considering inquiring about and/or acquiring. This particular review would have been much better and snappier if it as about 02 percent as long as it had actually turned out to be. Way too long. Far too much emphasis is being placed on 3D. Who in their right mind thinks 3D is a must have feature. It is nothing more than a fad that will be all but forgotten in 6 mos. I bought this projector for 3 main reasons; 1 it's LED! Which means fewer if not no lamp replacement. Traditional lamps are simply unreliable and expensive. 2 Viewsonic always has a good or very good picture. 3 Input lag for games. This projector simply meets all my tick boxes.If your rich and want to pay for lamps and 3D high end light cannons you'll likely never use, have at it. I am well aware of what input lag is and this projector handles it well. I have had a very good experience with this projector so far. There was one blackout during a game online with my brother. Still not sure if it was the projector of my machine but have not been able to duplicate the problem. I have seen all the other projectors out there and I am having a hard time justifying the price of some machines. My projector is throwing at 15' onto a 120" custom silver and Matte white spandex screen. The picture quality is simply amazing.